At the Göbekli Tepe archaeological site in Turkey, large barrel-shaped stone vessels were found that may have been used to hold copious amounts of beer made from wild grasses. These remnants indicate that the production of alcoholic beverages could date back at least 11,600 years — to the Stone Age. They also signify a great and enduring truth: Life is hard. So hard, we’ve been trying to escape it since time immemorial. These days, we’re apt to think of that truth in the past tense — life was hard, before we invented a mega-ton of cool technology, and cured a host of diseases, and lengthened mortality, and evolved from having to make a living from back-breaking labor, and threw off the rule of oppressive regimes, and solved the global proclivity for getting into massive wars. Now, life is good. We even have shirts and bumper stickers that say so. Yet our behavior belies our words. We haven’t gotten any happier on average over the last half century, even as advancements in technology and culture have exploded, and people in fact seem to be craving a substance-driven escape more than ever. While addiction to painkillers has gotten much attention of late, the use and abuse of alcohol has also been on the rise. In a decade’s time, people who engage in “high-risk drinking” (defined for men as having five or more drinks at least one day a week) rose by 30%, while the rate of people with “alcohol use disorder” went up 50%. Not only are more people drinking, they’re drinking more than they used to. Why? Well one can hypothesize all kinds of theories, but the truth is that life remains stubbornly hard. We have cured a thousand biological and societal ills, but death and disease persist, and we have yet to eradicate the kind of psychological pressures that thread themselves through everyday life — in fact, they have arguably increased many fold. Gone is the threat of lion attack; present is the anomie of living in a fragmented world, the loneliness of isolation, the restlessness of FOMO, the existential angst of walking through a grocery store, and being struck with the chest compressing sense of the possible meaninglessness of it all. Part of what makes life feel especially hard for us moderns is that despite the persistent reality of life’s thorny nature, our expectations continue to run in the very opposite direction. In times past, people expected life to be hard — and their spiritual traditions reinforced this notion. The Judeo-Christian religion taught that we live in a fallen world, and that there’s no going back to Eden. Buddhism taught that “Life is suffering.” Joyous moments were then seen as exceptions to the rule — happy reprieves from the status quo. The feeling of being a stranger in a strange land was not utterly inexplicable, but completely predictable. Today, we worship at the altar of lifestyle design and personal development, a faith premised on the idea that our lives and habits can be infinitely improved and perfected. We believe that life’s disappointments, heartaches, annoyances, and friction points are not inevitable, and can be overcome through the optimal prescription of hacks and planners and maxims. Certainly, much of what makes life hard can be avoided through right living and thinking, and no one should put up with unnecessary hardships and handicaps. Far better it would be, however, if we recognized that no matter what we do, it’s not possible to dull all of life’s sharp edges — and to thus set more reasonable expectations for our journey. As it is, we drink, but aren’t sure why, and even feel guilty about it. Far better it would be if we realized we should be getting drunk. Even drunker than we are now. As a cure for the difficulties of life, we’re often advised to become more present, more mindful, more aware. Yet the longer I live, the more I’ve come to feel that this is exactly wrong advice — at least in the sense of facing each moment in a state of unaltered rawness. Rather, we should strive to go through life in a semi-permanent state of intoxication. Baudelaire was definitely on to something, sans the wine bit. While there’s nothing wrong with an occasional drink to take the edge off, being perennially drunk with alcohol can’t well be recommended. It damages one’s health, while doing nothing to address the underlying cause of said edge, and in fact, quite possibly making it worse. But to be drunken continually with certain other things, this we should indeed seek to do. There are certain human pursuits that can rightly be called mind-altering, and yet do not numb the senses, nor merely distract from reality. Quite the opposite: they actually enhance one’s experiences, allowing you to engage life more fully. They provide the kind of stimulating, euphoric, emotion-heightening, inhibition-reducing, confidence-inspiring buzz that alcohol can, without the hangover in the morning. In fact, they leave you improved — healthier, happier, and better able to shoulder the existential pressures of the age. Such states represent not an escape from life, but a vivid embrace of it; one is still present, but loses the morbid self-consciousness that often accompanies stark, inwardly-focused mindfulness. Of all of life’s natural highs, physical exercise is certainly the most famous, and understandably so; the potent, buzz-creating physiological effect it produces has been well documented by scientific research. Exercise releases feel-good hormones like serotonin and dopamine, as well as natural, morphine-like opiates in the form of endorphins which reduce pain and anxiety, while producing feelings of euphoria and invincibility. Exercise may even spur the creation of natural endocannabinoids, similar to the high-producing substance found in marijuana. The natural buzz triggered by exercise arises most strongly from repetitive, rhythmic variety (think running, swimming, cycling), and is amplified both when the activity is engaged in with a partner, and when it is done outside; research has shown that exercise done in nature increases one’s feelings of vitality, enthusiasm pleasure, and self-esteem, while diminishing feelings of depression, tension, confusion, and anger. Exercise induces these physiological effects because it produces stress (not all stress is bad! ), which triggers our fight-or-flight response, preparing us to face a challenge/threat. Our bodies think we’re fleeing a saber-toothed tiger, even though we’re just out for a pleasure jog. This phenomenon arguably produces a psychological effect that’s just as important as the biological one. While it might not seem like subconsciously feeling that you’re in danger would be a good thing, it’s something we moderns crave on a visceral basis. Though we don’t consciously recognize it, part of the pleasure of exercise is surely in the way it mentally elevates us to a plane where our strength and fitness and agility matter. Where the stakes are higher than whether or not the traffic will be bad on the way to work. It reconnects our bodies to something more primal, more essential. We thrill to the fact that this normally inert lump of flesh is moving through space, with a purpose. When you reacquaint yourself with the power of your body — when your muscles contract, air fills your lungs, blood surges through your veins, and sweat drips from your brow — you feel more alive than at any other time in your otherwise pedestrian, sedentary day. It’s a feeling that’s keenly intoxicating. Ah, love. It’s oft been compared to a drug, and the analogy isn’t far from the mark. Research has found that new romantic love affects the chemistry of the brain in a way that is similar to cocaine and heroin. And just as with exercise, the fight-or-flight system is engaged, creating that paradoxical combination of excitement and danger, pleasure and pain. On the one hand, the uncertainty of new love (Do they like me as much as I like them? Will this last?) releases higher doses of cortisol, increasing one’s stress. On the other hand, an explosion of hormones and neurotransmitters like dopamine and oxytocin create feelings of intense euphoria and contentment. The neural pathways responsible for negative emotions like fear and social judgement are deactivated, elevating one’s confidence and willingness to take risks. Energy, motivation, and self-esteem soar. “That’s wonderful,” you may be thinking, “but the heady intoxication of early passionate love doesn’t last.” It’s true that romantic love typically mellows into “companionate love,” in which passion is replaced with a more stable, comfortable sense of attachment. Which is a fine state, but not really “inebriating” in the way of drug or drink. Happily, research shows that this leveling off process isn’t inevitable and that intense romantic love can in fact last for decades. The even better news is that this passionate long-term love not only maintains the confidence-boosting, pleasure-imparting benefits of new infatuation, but does so in the absence of the anxiety which accompanies a fledgling relationship. Instead of feeling stressed, long-term partners, secure in the future of their relationship, experience greater activity in the opiate-rich, pain-relieving parts of the brain, which protect against stress. Love — whether early or aged — buoys you up and makes you feel ready to take on the world; it’s a pair of glasses that makes every responsibility seem easier, every burden feel lighter, every joy burn brighter. It’s no wonder men have done many a great thing for the sake of love. Or that the longest longitudinal study on the lives of men found that those who achieved the most happiness and success had the most love in their lives. Or that among male fruit flies (which are surprisingly good genetic models for humans), those that are sexually rejected drink four times more alcohol than their brethren. We all crave the buzz of mind-altering euphoria, and we’ll get it, one way or the other. Better to find it in the arms of one’s beloved than at the bottom of a bottle. I must concur with Emerson; a good, face-to-face conversation is surely one of the most intoxicating pleasures of life. The source of its pleasures can be compared to an orchestral performance, with its combination of competition, cooperation, and artful harmony. Now, I don’t mean competition in the traditional sense — a conversation in which people are trying to out-do, one-up, and talk over each other will be a very poor conversation indeed. But competition in the sense that each individual performer is trying to do their best — to introduce an interesting topic or insight, to make a genuinely funny remark. Like a musical or sporting performance, there is in conversation the opportunity of risk and reward for each participant — the risk of saying something dumb; the reward of contributing something valuable. Each participant in a concert, or a conversation, wants to shine. Yet at the same time, there is the paramount need for cooperation. Each participant must understand the rhythm of the discussion. They must keep up with the beat, and make their contribution at the right time, and with the right tone. They can only add to what’s already been noised, if they’ve been intently listening to it. When these elements come together well in either a concert or a conversation, something musical, and even magical results. In terms of the latter, insights emerge, laughter swells, new, even life-changing perspectives are gained. In terms of both, each participant creates something bigger, richer, and more fascinatingly complex than they could have on their own. The comparison between conversation and orchestral music is quite apt, but we need yet another analogy to further unpack its pleasures. So let us now make what may seem an improbable comparison: engaging in conversation is also something like riding a motorcycle. You have to very much stay in the moment, and you cannot predict the twists, turns, and potholes you may encounter along the way. It’s a continuous sequence of action and reaction. In a conversation, you must listen to the tone and watch the facial expressions of those you’re speaking with, and adjust what you’re saying accordingly, and instantaneously. You have to think on the fly and improvise responses to unforeseen comments or questions. At least for a good conversation, the need for focus is total. The hormones released during conversation fortunately act as aids in this. When we talk with others, cortisol goes down, and oxytocin goes up, which makes social cues seem more salient and paying attention to social information feel more rewarding. Emotions heighten. The clarity of our mental signals sharpens, as distracting background neural activity dials down. We feel connected to the people we are with, while the rest of the world fades out. It’s no wonder we leave a great conversation feeling totally buzzed. Of Baudelaire’s proposed sources for drunkenness, perhaps the most intriguing is virtue. How can someone get wonderfully sloshed on virtue? When one decides to live virtuously, it is typically because he sees life as structured in the form of a certain kind of story. There is an ideal end — what the Greeks would call a telos — that he is questing towards; the virtues are those qualities which assist him in attaining it, while the vices are those qualities which stymie his progress. To embrace virtue is to embrace life as a journey, in which there is a right direction in which to travel, and in which obstacles must be overcome to stay on course. Such a view of life, in which there are real goods and real evils, inherently has a heroic cast to it. A genuine purpose. Having a mission, operating as an agent for Good, being willing to confront opposing forces, with the risk attendant to pursuing such a commitment, this is indeed an adventurous, exciting way to live. It’s good to acknowledge that life is hard. It’s good to realize that despite what toothpaste commercials and social media feeds tell you, life is not all shiny effervescence. It’s good to recognize that while life has the potential for an amazing amount of beauty and fun and joy, much of it is a confusing, uncertain, anxiety-ridden, boring, frustrating, empty-feeling grind — punctuated by occasional outright tragedy. Once you countenance this fact, it’s natural to want to get rip-roaring drunk. And you should. Get drunk on those things that inspire a genuine, long-lasting loss of inhibition and sense of confidence. Get drunk on those things that leave you with greater health, richer relationships, and a more meaningful purpose. Get drunk on those things that allow you to get outside yourself, and transcend the narrow confines of self-consciousness. Get drunk on those things that offer the perception of danger and the element of risk (and reward), and magnify all of life’s emotional summits. Get drunk on those things that aren’t escape hatches from life, but passages to a more vivid embrace of it. Drink up, drink deeply, and party on. Because life’s too short, and difficult, to go through it stone cold sober. 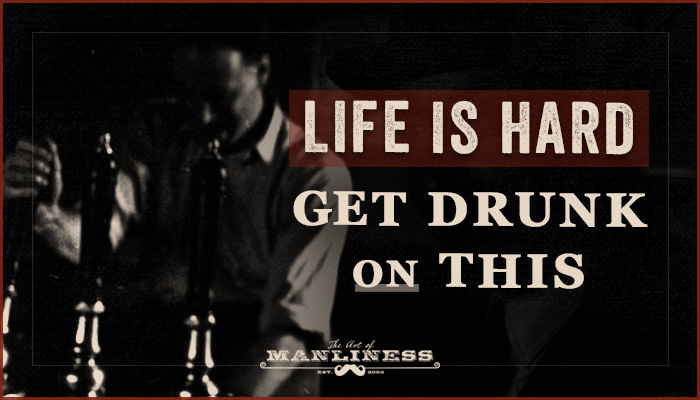 The post Life Is Hard; Get Drunk on This appeared first on The Art of Manliness.